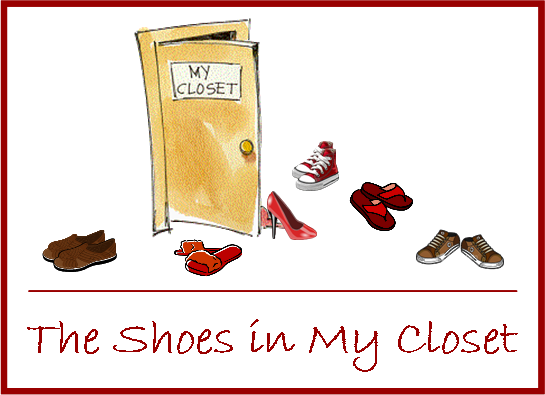 A Sweet Place Close to My "Sole"
Like most women, the shoes in my closet hold a sweet place close to my "sole". I often wonder why we place such importance on our shoes. Let's face it, shoes need to be comfortable, perfect color, just the right size, and oh, did I say cute! Shoes need to look just right. After all, they cover what most of us don't want others to see. The shoes in my closet have been in a pile, lined up on shelves, stored away in the original boxes, but now I find it necessary to place each pair in a clear storage box. You know the ones...cheap, clear, plastic with a lid. Oh, I'm not saying that they will always find their way into the box immediately especially if I am in a hurry, but the intention will be there. Yes, the new year is coming quickly and it will be good time to clean out, straighten up, and buckle down. My shoes do need an overhaul, but it is time to look at all the shoes I have worn in my lifetime. You may think I am talking about the real thing but there is another kind of shoe I am thinking about. The ones that leave footprints in your heart. I thought I had worn just about all of them, but I guess there is always another pair waiting to be tried on and worn out. So I am ready to share with you the shoes in my closet in clear plastic boxes for all to see. Nothing hidden here. I am gearing up for this blog thing! Fear sets in! Time can't be found! BUT.......I WILL!